Social media has now been around for a decade and it is commonly used for private purposes and in consumer brand companies. But even though it offers great potential, the usage in the business-to-business sector is still less frequent in comparison to the business-to-consumer markets. Industrial managers seem to have limited understanding and struggle with implementation of strategies and successful use of social media in their corporation. Also in the literature, social media cases regarding the business-to-business context have only received little attention. Therefore, this thesis will show the concept of social media in this specific context by investigating factors that determine the adoption of social media in business-to-business organizations. The thesis points out how social media is used and what content is shared in the organization’s innovation process, in collaboration and communication with customers and partners, and in the marketing and sales department. The analysis shows that social media in the business-to-business sector is rather used for relationship building and as an information exchange platform. The thesis also shows what outcomes can result from social media usage and that it is beneficial for industrial firms to be active on social media. To eliminate barriers and realize social media’s potential, we identify managerial implications to successfully implement social media in the business-to-business sector. Even though social media is widely popular and is not only used by individuals, but also implemented successfully by business-to-consumer (B2C) firms, there are still many common reservations when it comes to social media usage in the business-to-business (B2B) sector. One typical argument is that social media is only meaningful in the consumer market. (Feurer and Klarmann 2016, p.14). 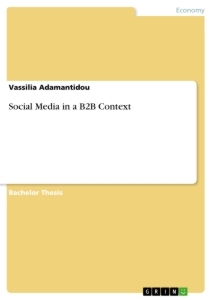 The purpose of this thesis is to show how B2B firms use social media in their specific business context and point out why it is advantageous for B2B firms to participate in social media. Therefore, this thesis focuses on the B2B organizations’ social media adoption, their actual social media usage and outcomes they can reach by using social media. In the existing literature only little attention is paid to social media in the B2B context and it is usually focused on one aspect, that means they either focus on the firms’ social media adoption, or their usage or outcomes from participation in social media. But this paper will include all these three aspects and put them together by following the framework below, which will be filled with our findings after each chapter to give a broad overview on social media in a B2B context. This paper starts with providing short definitions and characteristics of the important terms that serve as conceptual background information. In the next parts, answers to the paper’s three research question (RQ) will be given: The first part deals with social media adoption in B2B markets and gives answers to the question (RQ1) on what factors are affecting social media adoption in B2B markets and how they interrelate. These factors are categorized into social media related, personal and organizational factors. The second part of this paper responds to the second question (RQ2) on how B2B firms use social media. Hereby, the focus will be on the external usage and which differs from the B2C marketers’ usage due to the industrial market’s key characteristics. This section is divided up into four categories, where social media is mainly used within the B2B company: in the innovation process, in collaboration and communication with partners and customers, in marketing and in sales. The next section focuses on the outcomes by answering the third question (RQ3): What outcomes can be gained by using social media in B2B markets? Finally, the findings will be discussed and recommendations for managerial action and future research on social media in B2B markets will be elaborated. There can be found many definitions of the terms Web 2.0 and Social Media in the literature. Web 2.0 and Social Media are often even used synonymously as there is no unified definition (Kaplan and Haenlein 2010). Constantinides (2014, p. 42) defines Web 2.0 as internet applications, which are open source available, interactive and controlled by the internet-users. Kaplan and Haenlein (2010, p. 61) define social media as “a group of Internet-based applications that build on the ideological and technological foundations of Web 2.0 and that allow the creation and exchange of User Generated Content”. The second definition is given by Constantinides (2014, p. 42) and similar to the first one, but extended in terms of possible use. Constantinides states that the term Social Media contains all Web 2.0 applications, such as blogs, social networking sites or forums, that enable users to create, edit and share user generated content. So, to combine both terms, the Web 2.0 serves as a platform for the development of Social Media. “User Generated Content” aggregates all the forms of internet-users’ social media application usage and their creation of media content on websites or social networking sites, which are publicly available (Kaplan and Haenlein 2010, p. 61). The above definitions of social media include a great amount of social media platforms and applications. Social media, can be classified into the following different generic types, which are also relevant in a B2B context. There are collaborative projects like Wikipedia (Kreutzer, Rumler and Wille-Baumkauff 2015, Kärkkäinen, Jussila and Janhonen 2011), where many users can participate by creating, removing or changing the content available on this platform (Kaplan and Haenlein 2010, p. 62). Another type is blogs or microblogs, which are blogs with entries restricted to about 200 symbols, such as Twitter (Kreutzer, Rumler, Wille-Baumkauff 2015, p. 194), where users can create entries in the form of articles, called blogposts, that provide information on the bloggers’ lives or on a specific topic. These entries usually consist of texts, but can be linked to different forms of images, audio, video, or a combination of them (Kaplan and Haenlein 2010, p. 63). The blogposts usually appear periodically and the people following the blog have the opportunity to interact with the blogger or other followers, e.g. through the comment function or by reposting, means forwarding a blogpost (Kreutzer, Rumler, Wille-Baumkauff 2015, p. 195). Professional (e.g. LinkedIn) and personal social networking sites, such as Facebook, are applications where users can create their own profile containing personal information and connect with other users, that can be e.g. friends or colleagues. Social networking site users can send private messages, communicate publicly and follow fan pages, whose posts appear in their newsfeed. (Kaplan and Haenlein 2010; Kreutzer, Rumler, Wille-Baumkauff 2015; Kärkkäinen, Jussila, Janhonen 2011). content sharing platforms, e.g.  YouTube, give users a suitable stage to upload different types of multimedia content like videos, presentations, audio content or images and allows the platform’s users to share or comment on that uploaded content. (Kaplan and Haenlein 2010, p. 63). Finally, there are discussion forums, sometimes also called online communities, where users can exchange their knowledge, ideas and experience on specific topics (Keinänen and Kuivalainen 2015, p. 712). In these forums, users can present thematically linked problems or questions and, through the interaction and exchange of information with the community, find solutions. (Bruhn, Schnebelen and Schäfer 2014, p. 166). SEMPO (http://www.sempo.org/?page=glossary#b) defines B2B markets as business, where products or services are purchased to other business, whereas on the contrary, business-to-consumer companies market their products and services to individual end-consumers. As cited by Jussila, Kärkkäinen and Aramo-Immonen (2014, p. 607) the products or services on B2B markets are more complex as they are purchased to large organizations, which demand special products and services customized to their production process. There are fewer customers on B2B markets in forms of organizations than there are consumers in B2C markets. Furthermore, the development of the B2B products or services takes more time than it does on consumer markets. This is because the development process is performed in direct and intense cooperation between the B2B organization and the customer organizations since the products or services are individualized orders (Habibi et al. 2015; Jussila, Kärkkäinen and Aramo-Immonen 2014). Due to high value purchases and higher investments, there is also a higher risk perception, as the costs for mistakes are high (Kreutzer, Rumler, Wille-Baumkauff 2015, pp.15-17). Therefore, the buying decision is made by a group of people, the so-called buying center (Kreutzer 2013, pp. 34-35). This group is acquiring a lot of information, considering different criteria and evaluating alternatives before making their buying decision. This behavior is slowing the decision-making cycle and therefore the whole buying process in B2B markets takes longer than in consumer markets (Rieck 2000, p. 24). Hereby, the members of the buying center are following a formalized decision making process and because of the high investment and purchase risk, the decision for a purchase normally has to be justified in measurable terms (Rieck 2000; Kreutzer, Rumler, Wille-Baumkauff 2015). As cited by Jussila, Kärkkäinen and Aramo-Immonen (2014, p. 607), the products in B2B markets are more durable and, also because of the product’s complexity, aftersales supportive service provided by the B2B organization is necessary (Kreutzer, Rumler, Wille-Baumkauff 2015, pp. 15-16). These market characteristics lead to a long-term relationship between the B2B organization and its customers (Habibi et al. 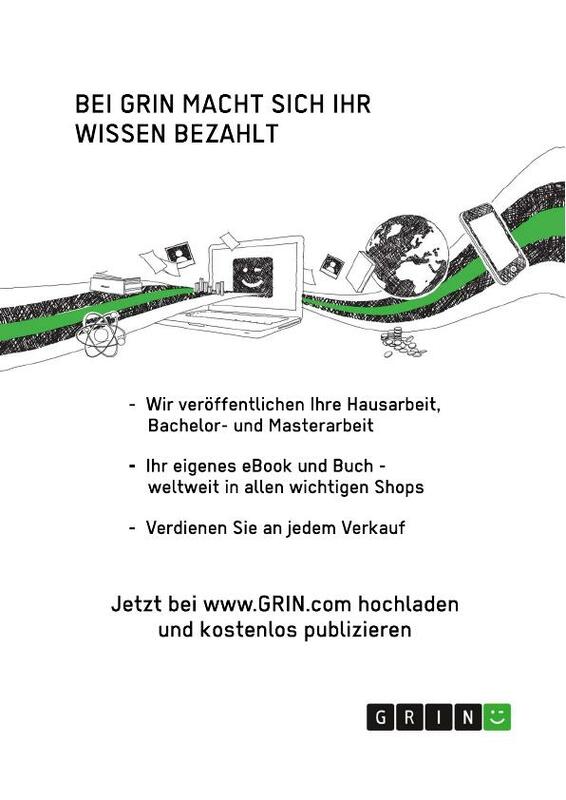 2015; Kreutzer, Rumler, Wille-Baumkauff 2015) and make service, support and the buyer-seller relationship crucial factors in the decision-making process (Gillin and Schwartzman 2011, p. 7). After clarifying the conceptual background, we now build on that information with focusing on the social media adoption in industrial markets and by doing this provide answer to our first research question. When talking about social media adoption an attitudinal component, in particular the extent to which a person is positively inclined towards social media and also the degree of active social media participation, which is a behavioral component, are considered. In this special context, it is about the adoption of social media in professional activities in B2B organizations. So, in the following, the focused will be on the factors, that drive the adoption, considering three different classifications: social media related factors, personal factors/user characteristics and factors regarding the situational context respectively the organization. In this thesis, we will assume that if social media is adopted by an organization, it is also being used. Therefore, in this thesis, the adoption of social media and the actual usage in the business context will be used as synonyms (Bill 2015, p.42). One social media related factor driving the adoption of social media in B2B organizations is perceived usefulness (Bill 2015; Lacka, Chong 2016; Siamagka et al. 2015). According to Davis (1989, p. 320), perceived usefulness implies that people will use an application if they think that they can improve their job performance with its usage. Consequently, the higher the perceived usefulness, the greater is the user’s belief that he or she can achieve a positive user-performance-relationship when using the system. In our case, that system is social media. Another factor driving social media adoption is perceived ease of use, which is also defined by Davis (1989, p. 320) “as the extent to which a person believes that using the system will be free of effort”. That means that an application, in our context social media, which is perceived to be easier to use than another, is more likely to be accepted by users respectively adopted by B2B organizations. These two factors are part of the Technology Acceptance Model (TAM), developed by Davis in 1989 (cf. Davis 1989), which theorizes that an individual’s adoption of a technology system- in this thesis’ context the system is social media- is determined by the factors perceived usefulness and perceived ease of use. This theory also states that further the external variables, e.g. system characteristics, development process, training, affecting social media adoption, what Davis refers to as the generalized term intention to use, are mediated by perceived usefulness and perceived ease of use (Venkatesh and Davis 2000, p.187). The TAM has become an important verified and influential model for predicting user acceptance (Venkatesh and Davis 2000, p. 187), which was also tested in several studies regarding social media adoption of B2B organizations. In this context, Siamagka et al. (2015) and Lacka and Chong (2016) test in their studies the impact of perceived usefulness on social media adoption in industrial markets and they confirm a positive relationship. Hereby, one study considers age and the size of firm as control variables (Siamagka et al. 2015, p. 92). Bill (2015, pp. 66-67) also finds out that perceived usefulness is positively influencing the social media adoption in B2B firms’ sales department. Only one recent study by Keinänen and Kuivalainen (2015, p. 717) does not confirm the positive relationship between perceived usefulness and B2B firms’ social media adoption. This study tests its findings among an information technology service company’s key customer accounts. Two studies investigate the correlation between perceived ease of use and social media adoption in a B2B context and both do not find support for the hypothesis that perceived ease of use is positively influencing social media adoption in B2B markets (Keinänen, Kuivalainen 2015; Siamagka et al. 2015), while a third one by Bill (2015, p. 67) is able to confirm this hypothesis in the B2B sales context. Lacka and Chong (2016) investigate the construct “perceived usability” on social media adoption, which is defined as the belief of whether social media sites participants are capable of accomplishing B2B marketing objectives when using those sites. This construct refers to the users’ ability to apply a new technology and the perception of effort involved in the use of this technology to achieve a desired goal (Lacka and Chong 2016, p. 83). As Lacka’s and Chong’s (2016) definition of perceived usability includes the construct of perceived ease of use, in this thesis we will equate the construct of perceived ease of use with perceived usability. In their study, they could confirm perceived usability as antecedent of social media adoption in industrial markets (Lacka and Chong 2016, pp. 87-88). According to Siamagka et al. (2015, p. 93) and Chompis et al. (2012, p. 223), perceived ease of use is positively influencing social media perceived usefulness, while Lacka and Chong (2016, p. 87) cannot find support for that relationship. Siamagka et al (2015, p. 93) also investigate further antecedents of perceived usefulness. They can confirm that the perception about image when using social media positively impacts perceived usefulness, while perceived barriers of social media usage have a negative influence on social media perceived usefulness. Keinänen and Kuivalainen (2015, p. 717) reject the hypothesis that perceived benefits of social media usage for B2B activities can increase social media adoption. According to another recent study, learnability, which is a fundamental usability attribute as technologies should be easy to learn and to understand in order to be used, memorability, that means the users’ ability to easily memorize how social media should be used to perform a business task effectively, and the efficiency of social media sites are influencing the users’ perceived usability, what we refer to as perceived ease of use. Satisfaction and the possibility of making errors when using social media do not significantly influence perceived usability. In this study, the researchers also consider perceived utility, which “refers to the marketers’ perception of whether, via social media sites, B2B marketing objectives can be achieved”, and find a positive relationship between perceived utility and social media adoption for B2B marketing as well as between perceived utility and perceived usefulness (Lacka and Chong 2016, pp. 84-87). Also, personal aspects of the B2B firm’s employees are considered in several studies as determinants for the social media adoption. The researchers Keinänen and Kuivalainen (2015) investigate in their study the relationship between different user characteristics and social media usage. They find a positive relationship between age and social media business usage, i.e. younger people tend to use social media more often. Also, a person’s job level does affect his or her social media usage, while the hypothesis that gender affects the social media adoption, is rejected (Keinänen and Kuivalainen 2015, p. 717). Schultz, Schwepker Jr. and Good (2012, p. 185) confirm the finding that younger people are more likely to adopt social media than older people. While Bill (2015, pp. 67, 74), considering social media adoption in sales in his study, rejects this hypothesis, but states that age has an indirect effect on social media adoption by influencing the user’s perceived usefulness, i.e. even if older people do not perceive social media as useful, they might still be using it in their business context. Siamagka et al. (2015, pp. 92-93) treat age as a control variable in their study and they also find a connection between age and social media adoption. Contrary to their expectations, they observe that rather older executives are adopting social media. Another study also considers age as a control variable, but cannot find a significant influence of age on social media adoption (Guesalaga 2016, p.76). In his study, Bill (2015, p. 67) tests the hypothesis, whether there is a positive relationship between the experience of salespeople in sales and their social media adoption, but does not find support for it. One recent study investigates if individual competence and individual commitment to social media have an impact on social media adoption. Individual commitment to social media refers to how actively an individual is participating in social media and the study supports the assumption, that it is a relevant predictor for social media adoption. On the other hand, individual competence, that is the user’s familiarity and ability to use social media, is rejected as being a determinant for social media usage (Guesalaga 2016, pp. 74, 76). Keinänen and Kuivalainen (2015, p. 717) investigate if social media personal use has an impact on social media adoption in B2B firms and find out that the more social media is used for personal reasons, the more it will be used for business purposes. After figuring out which social media related and personal factors are driving social media adoption of B2B organizations, we will now focus on determinants related to the organization itself. Siamagka et al. (2015, p. 93) prove in their study that organization’s innovativeness has a positive relationship to social media adoption. They also expect organizational innovativeness to be a moderator, which strengthens the influence of perceived usefulness on social media adoption, as well as perceived ease of use on adoption. But they cannot confirm organizational innovativeness’ role as moderator. Schultz, Schwepker Jr. and Good (2012, p. 185) prove that social media norms inside the organization are determining the social media business usage. Customers’ and supervisors’ social media usage do not influence the employees’ adoption of social media (Bill 2015, p. 67). But regarding the firm’s customers, Guesalaga (2016, p. 76) finds a positive relationship between customer engagement and social media usage in sales. Customer engagement is defined as the extent to which the firm’s customers are actively participating in social media. Organizational competence, that the researcher defines as the firm’s social media knowledge of how to use it and organizational commitment to social media, the degree of which the company actively engages with social media and actually uses it, determine the social media adoption in the B2B organization. These two factors, organizational competence and commitment to social media, are also mediating the relationship between customer engagement and social media adoption. The investigation confirms that individual commitment and individual competence are as well mediating the effect between customer engagement and social media adoption in B2B markets (Guesalaga 2016, pp. 74,76). Keinänen and Kuivalainen (2015, p.717) analyze in their study if corporate culture does influence the social media adoption of B2B firms. But they do not find a connection between the supervisors’ benefit perception and social media use and therefore reject the hypothesis that the company can motivate its employees to use social media through its supportive corporate culture, as well. In another study, Chompis et al. (2012, p. 223) prove that the system quality is whether affecting perceived usefulness nor perceived ease of use. Guesalaga (2016, p. 76) and Siamagka et al. (2015) both consider the firm’s size as a control variable in their studies and do not find a significant relationship between the size of the organization and social media adoption. As a summary of this chapter on social media adoption, the following figure represents the first part of the framework filled with this chapter’s findings. This chapter will look at the function of social media in B2B markets and why it is used by the B2B marketers in the firm’s innovation process, the collaboration and communication with partners and subsequently focus on how social media is used for marketing and sales purposes. Social media in the B2B context is used in the customer, as well as in the partner, interface. In both contexts, it serves as a platform, where firms can add news, post photos, videos and events or competitions (Brennan and Croft 2012, p. 108). Jussila, Kärkkäinen and Aramo-Immonen (2014) analyze in their study that B2B marketers use social media more actively in the customer interface than with partners, but the usage structure is similar in both categories. In the customer interface, the researchers discover a strong positive relationship between social media usage and perceived potential in marketing, while considering social media usage with partners, the strongest relationship is between social media partner usage and perceived potential in network management (Jussila, Kärkkäinen and Aramo-Immonen 2014, pp. 609-610). In general, the main reasons for B2B firms’ social media usage are the acquisition of new customers, the maintenance of relationships with existing customers respectively partners, increasing awareness and communication of the brand on social media platforms, feedback reception and interaction with suppliers (Michaelidou, Siamagka and Christodoulides 2011, p. 1156). The most popular social media platforms in B2B markets are the private social network Facebook and LinkedIn, which is a professional social networking site, Twitter, a microblog, and the video sharing platform YouTube. (Michaelidou, Siamagka and Christodoulides; Stumpenhagen 2013). Social media offers several application potentials to push B2B firm’s innovation process forward. It gives the B2B organization the opportunity to develop new product ideas or services through exchange with the firm’s customers and by offering them different participation options (Ivens, Rauschnabel, Leischnig 2016, pp. 426-427), enabled through social media functions, such as short questionnaires or competitions (Bruhn, Schnebelen and Schäfer 2014, p.169).